How can nation’s leading WR still be an NFL draft afterthought? Why isn’t anyone talking about Keyarris Garrett? 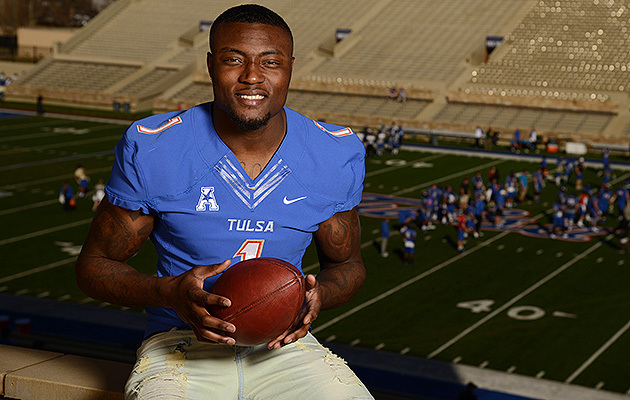 The nation’s leading wide receiver out of Tulsa is trying to climb up NFL draft boards. INDIANAPOLIS — Keyarris Garrett is lying face down on a blue trainer’s table, his implausibly long frame dangling over both edges. His legs, one of which sports a long vertical scar above the ankle, extend out over one end, and his 34½” arms, the longest of any receiver in the draft, hang pendant over the other to the point where his palms can rest comfortably on the floor. It’s about 12 hours from when Garrett will run the 40-yard dash on the turf of Lucas Oil Field; 12 hours from when he plans to prove to anyone who may be sleeping on him that they would be making a serious mistake. Why isn’t anyone talking about Keyarris Garrett, anyway? It didn’t take very long into the NFL combine for Garrett to realize that he is being regarded as little more than an afterthought in the 2016 receiving class. But he can’t quite figure out why. He’s an athletic marvel, tall, lean, strong, with the aforementioned long limbs that teams profess to love in pass catchers. He’s never been in trouble, never been thrown off a team, never failed a drug test. Oh, and he led the NCAA with 1,588 receiving yards last year. There are the concerns about his injury history, about that left leg. There is the knock that he played at Tulsa, a school outside the Power 5 conferences—the same knock that NFL teams once used as a justification for passing on Antonio Brown (Western Michigan, sixth-round pick) and Brandon Marshall (Central Florida, fourth round). And there’s the insinuation that his production is merely a product of the spread offense—which doesn’t seem to be the case with Baylor’s Corey Coleman, a projected first round selection, nor was it with Texas A&M’s Mike Evans, a top-10 pick in 2014. His eyes are closed now. He has been having dreams about his upcoming combine workout for weeks, their frequency increasing the closer he came to this day. He feels ready, prepared, a long way from where he was two years ago when he wasn’t sure if he’d ever be able to play football again. Garrett slinks off the table and puts on his NFL issued jumpsuit with “WO No. 16” on it. Sure, the positions are ranked in alphabetical order, but for Garrett that number could just as well serve as a reminder of where he’s been placed within this draft’s pecking order. When the receivers came out for their media availability a day earlier, Garrett wondered why the nation’s leading receiver wasn’t given a podium. Instead he was placed at a table, and a half-filled table at that. But this is nothing new for the soft-spoken kid from Daingerfield. He feels he’s been overlooked his entire life. Daingerfield is a small town in East Texas near the border of Louisiana and Arkansas, a town that you need to want to get to in order to find. It is also a town that closes stores early on Friday nights so that residents can make it to the football games on time. What Bowman didn’t know, however, was that after he forced the pair from the field, they’d go back to Garrett’s house, camp out on his front lawn and continue connecting on passes. In his senior season at Daingerfield, Garrett had 25 touchdown receptions—including the game-winning 69-yard heave from Boyd with 26 seconds left in the state championship game, clinching the school’s third consecutive title. Despite his senior class totaling around 100 students, six players from that team received Division I football scholarships. Some ended up with offers from Texas, others from Baylor. But not Garrett. Garrett’s sophomore season at Tulsa was a breakout of sorts—67 receptions, 845 yards and nine touchdowns, good for second team all-conference. So as he headed into his junior year, he told Boyd he was priming for a big season. The overlooked receiver from Daingerfield was finally going to get some respect. They say the noise the bones made as they snapped in two could be heard in the fifth row of the stadium. That it was like a shotgun going off. That they had never seen anything like it before. It was a routine play in the second game of Garrett’s junior season, a home contest against Colorado State. It was second-and-seven in what wound up being the game-winning drive, and Garrett caught a simple out route. As he tried to cut up field, it looked as if he had lost his footing and tripped. But when he tried to get back up he could only make it to his hands and knees. 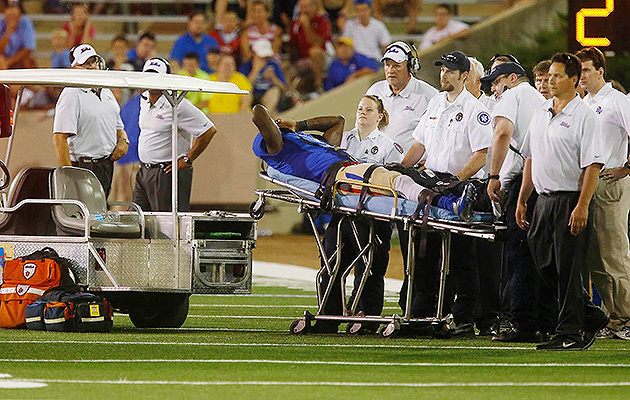 The ambulance drove out on the field as the trainers splinted his leg. They took Garrett directly to the hospital for surgery—which he forced the doctors to hold off on until he received the final score of the game. Doctors told Garrett that he had fractured both his tibia and his fibula, and they inserted a titanium rod and several metal screws. It took him months to even be able to move his ankle again. Almost as soon as he was getting his strength back, he woke up one morning and discovered an unseemly circular protuberance on his leg. Doctors said that the wound had gotten infected, which meant Garrett would need to have several more surgeries to remove the titanium rod and the screws and flush out the infection. He would have to start the rehab process all over again. The answer he received was yes, but Garrett wasn’t sure if it was said just to keep his spirits up. He didn’t know if he believed it. So he learned to appreciate the small accomplishments. Like the day he was able to walk without crutches. And the day he was allowed to use the underwater treadmill, and then, finally, when he was able to run on the anti-gravity machine. Garrett put up 14 catches for 189 yards on Oklahoma’s stout secondary in a losing effort on Oct. 19. During the summer before the 2015 season, Garrett set up a tennis ball machine in the bowels of Tulsa’s football stadium. He filled a five-gallon trash can with balls that the tennis team had discarded and would catch 300 a day, shot 40 miles per hour out of the machine, from about seven yards away. “He knew he had to have a big year,” Evans says. Right before his senior season started, however, Garrett got word that his grandfather’s cancer had worsened. Sonny Garrett had been the strongest male influence in Keyarris’s life, his best friend, the first person he would talk to whenever he had a problem. When Keyarris saw his grandfather in the hospital bed, mouth filled with tubes, it was hard to understand what he was saying; Keyarris had to strain his ears to listen. Sonny Garrett died the Wednesday before Tulsa’s season opener against Florida Atlantic, but Keyarris knew that his grandfather would have wanted him to play. So he went out and had 163 receiving yards. The next week, against New Mexico, he put up 102 yards. In their third game of the season, the Golden Hurricane faced No. 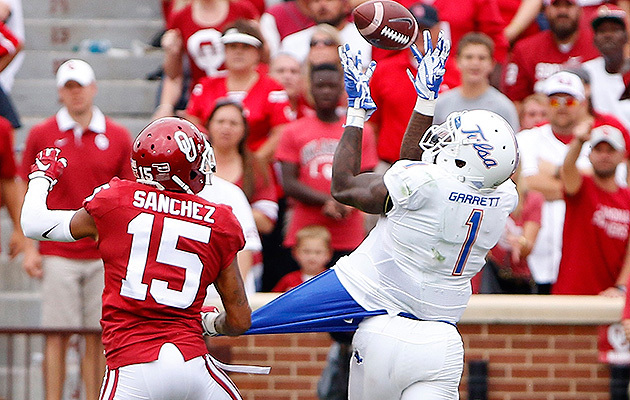 16 Oklahoma in Norman, and Garrett was matched up against Zack Sanchez, a semifinalist for the Thorpe Award given to the nation’s top defensive back. It was the first real test for Garrett, a barometer to see how he fared against top competition. 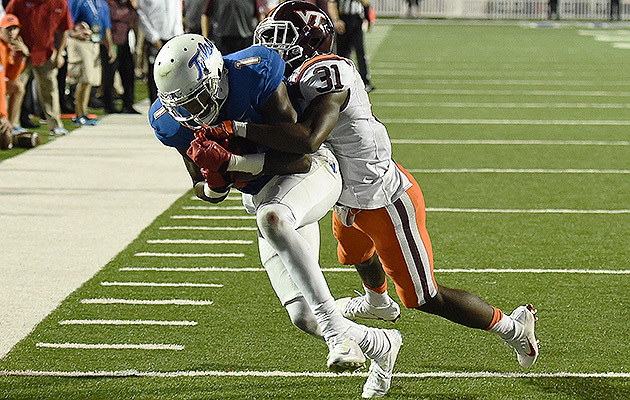 Fourteen catches, 189 yards and a touchdown later, his performance was overshadowed by a Tulsa loss. Garrett had 216 yards and a TD in that game, a Tulsa victory. He had 137 yards and another score in the team’s bowl loss to Virginia Tech. That performance cemented his status as the nation’s leading receiver. With 137 yards in the Camping World Independence Bowl, Garrett edged Bowling Green’s Roger Lewis to become the nation’s leading receiver. Garrett ambles out of the trainer’s room, picking up his to-go bag, which contains a steak dinner, on his way out. He folds himself into a cab, anxious to get back to his hotel room and get a full night of sleep for the first time all week. In the months leading up to the combine, Garrett worked with speed trainer Tony Villani and receiving guru Bill Welle. Welle helped Garrett refine his technique, the efficiency of his movement. In a five yard by five yard square, Garrett would make precise cuts around four different cones—load, plant, step—over and over again. Garrett’s insatiable desire to improve reminded Welle of another one of his clients. “You never know how guys are going to respond in Year 1, Year 2, Year 3 in the league,” Welle says. “But you just hope you get with someone who has the work ethic of a Larry Fitzgerald or a Keyarris Garrett. Those are the guys you know will be able to stick it out. Garrett is far from braggadocious; he just has the unshakable belief that he is the best receiver in this draft. The following day, Garrett ran the 40 in 4.53 seconds—faster than anyone expected, faster than any receiver who approached his size and weight, yet still not as fast as Garrett knows he is able to run. (Several NFL scouts had him timed in the 4.45 range.) He also jumped 36.5" vertically, and 10'8" in the broad jump—both top-10 performances for his position, yet he was still barely mentioned on the NFL Network broadcast. A receiver with all the physical traits NFL teams covet, with the level of production players desire, yet still fighting the small school bias, still trying to eradicate any lingering injury concerns. Still being slept on. Maybe he hasn’t proven everyone wrong yet. But he knows he will. Just like he dreamt it.